Welcome to our designated umbrella portion of the site. All backyards need an umbrella. No matter how much you enjoy spending time out of doors, you will certainly seek relief or shelter from time to time; if not you, then certainly your guests. Umbrellas, we have found, are a much under-rated patio accessory. Some homeowners opt out of patio umbrellas because of their large size or their downright instability during thunderstorms. A good patio umbrella will tie your entire patio together by creating a focal point and shading you and guests from the beating summer sun. There’s nothing like roasting under a full 1 o’clock July sun. A good umbrella will ensure you can enjoy your backyard patio to the fullest. There is a lot to choose from out there, so we scoured far and wide to select the ones with the best features, style and price. 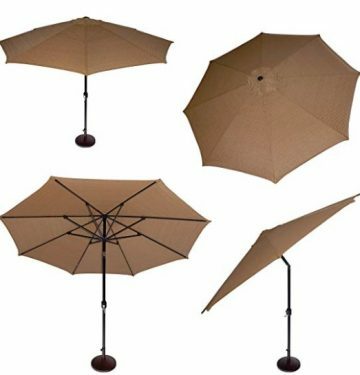 We know that aesthetics are a big selling point, so we have provided umbrellas that combine great style with practical features like being fade-resistant. This indicates a thoroughly designed product where so much value is placed on the look of it, that the quality of the fabric matches. Within our selection, you will find some really great contemporary designs that are more adaptable. For example, you will find offset umbrellas that secure to a post or wall and hang off the end of an arm, similar to a tree branch. This style you can set up virtually anywhere in your yard. 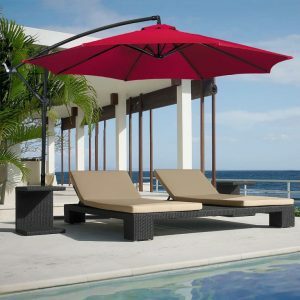 You will even find half-umbrellas that are designed to stand up against a wall or lengthen an existing canopy. 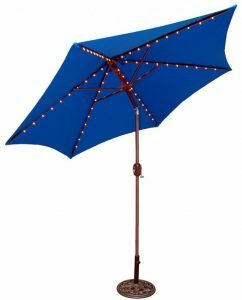 We have made sure to include umbrellas that are wind- and fade-resistant; we’ve even listed umbrellas with built-in lighting for a full summer patio party experience!